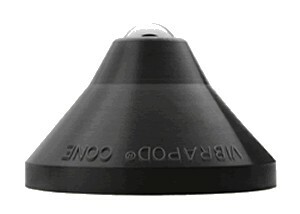 The Vibrapod Cone is the new shape of affordable vibration control. 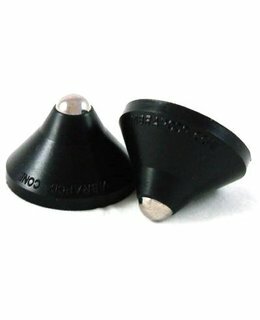 Used on their own or in conjunction with a set of Vibrapods, Vibrapod Cones are extremely effective at reducing vibration and noise. 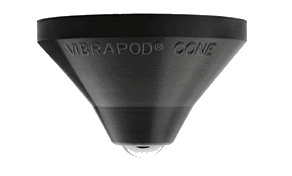 Vibrapod Cones support up to 11 kg per cone and can be used either ball-up or ball-down. Vibrapod Cones enhance the performance of audio and video gear by protecting equipment from both room and rack vibrations. The ball bearing quickly siphons energy away from the chassis into the Vibrapod Cone which is a very powerful energy absorber, energy goes in and doesn't come out. Used by themselves Vibrapod Cones are very effective but are most effective when used in combination with the amazingly affordable Vibrapods. 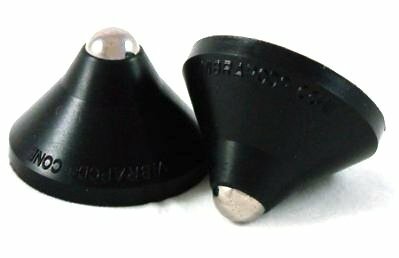 The Vibrapod Cone is made from the same material as Vibrapods, but is cone shaped, with a ball bearing inserted in the tip and a flanged base for proper seating on a Vibrapod. Using a set underneath your components will give you quieter backgrounds and gobs more detail. Subtle clues that lend to the realism of the performance will be easier to hear and your music will be richer and less fatiguing. Easy to use and extremely affordable, there's no reason not to put Vibrapods and Vibrapod Cones under every component.